Two and half hours after the suspected Stoneman Douglas High shooter was detained, video recorders began rolling at the Broward Sheriff’s Office where Nikolas Cruz was taken. For the next 11 hours, until shortly after 5 the next morning, Cruz would confess his crimes, but also reveal much more — allegedly telling a detective that a demon in his head told him to burn, kill and destroy. While Florida law prohibits the "substance of a confession" being released until it is presented at trial or the case is closed, the state attorneys office on Monday released a large portion of the statement that a judge determined did not constitute the substance of a confession. Attorneys for Cruz argued none of the material should be released, saying it would prejudice the public and make it impossible for the accused killer to get a fair trial. He is charged with 17 counts of murder and 17 of attempted murder and the state has announced it will seek the death penalty. So on Monday, the state attorney complied with public records requests from NBC 6 and others and released written transcripts of the statement, with the redactions ordered by the judge. The office said it is still preparing to release the video of the statement. While the transcript is now public, the judge noted, that does not mean any or all of it will ultimately be admitted into evidence in a trial. Those decisions will be made as the case proceeds. He then was walked into the Broward Sheriff’s Office, where Det. John Curcio began interrogating him. At one point, when Curcio left the room to get water, Cruz exclaimed "Kill me. Just f---ing kill me," according to the transcript. Curcio, asking about Cruz’ life history, tells him, "I only can talk to you to hear from you what was going on with you," the defense quoted him as saying in its motion to block release of the statement. The questioning, it says, was intended to assist prosecutors to establish premeditation and to undermine the “potential of the defense of insanity,” the defense stated. Cruz's statements about the shooting are blacked out, but the transcript is otherwise wide-ranging, dealing with the death of Cruz's parents, his penchant for killing animals, his former girlfriend, his brother, guns, suicide attempts and, especially, the voice in his head. He told Curcio the voice appeared after his father died about 15 years ago but got worse after his mother died of pneumonia in November. 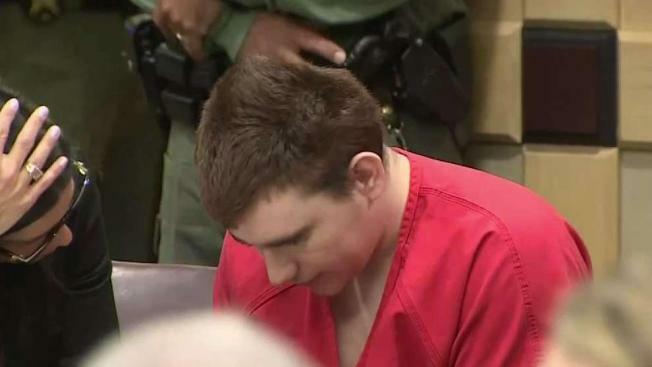 At some point, Cruz requests the presence of a psychologist, but Curcio did not give him the opportunity to have one present, the defense stated.